At the same time that journalists and human rights groups are denouncing the problem of extra-judicial killings by security forces in El Salvador, the government is increasing even more its iron fist approach to law enforcement. The government has announced that it is deploying more military and police at bus stops, markets and plazas and other places where people congregate in San Salvador. 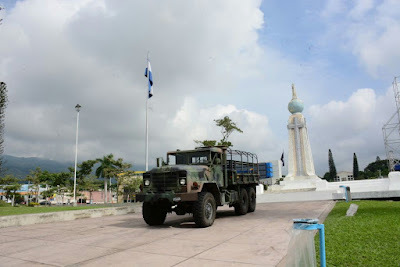 In the two days since the announcement, I saw heavily armed soldiers and military equipment at such places at Plaza Salvador del Mundo and the Arbol de Paz traffic circle. 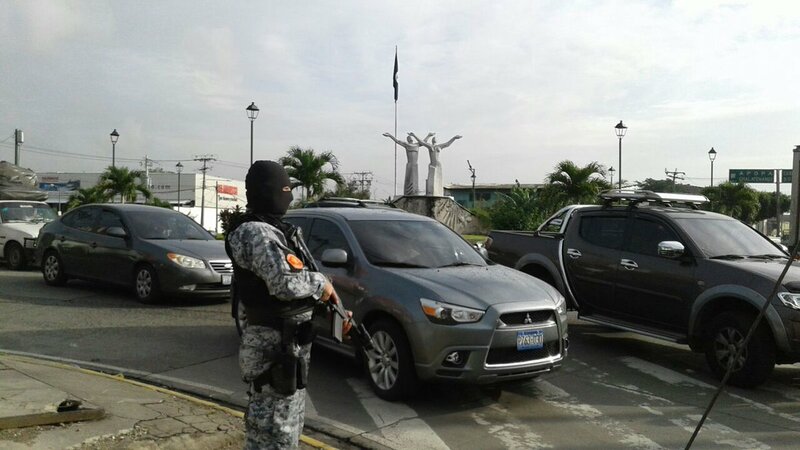 In addition, the security forces were enacting random checkpoints on the streets in the capital city, adding to the vehicular chaos of San Salvador. Passengers at bus terminals were being checked for identification to determine if they were on wanted lists. Police were also shown checking finger prints of youth who were not carrying identification with them. The government announced that it had staged round-ups of gang members across the country. In "Operation Regional Shield," authorities have been executing orders to capture 615 purported gang members throughout the country. From time-to-time, the government of El Salvador has made other shows of force like this. The visible presence of security forces disappears after awhile. There is no appreciable change in the level of crime or violence in the country.